I’ll admit it. I’m not a huge kale fan. Actually, I’m not a huge veggie fan. But when I first heard of chips made from veggies, it piqued my interest. Kale is one of those veggies that make you healthy just by looking at it. Some people call it a super food. And I’ll agree, kale is super, when doused in oil and sprinkled with salt. Mmmmm. You’re gonna love these. There are quite a few ways to make kale chips. How long do you cook it? What temperature? Do I sprinkle the salt on them before or after they cook? What seasoning is best? Do I use the food dehydrator or the oven? Well, after quite a bit of experimenting, I came up with what I consider the quickest and tastiest way to make kale chips. A kale bush growing in our garden. Preheat your oven to 200 degree Fahrenheit. Wash your kale thoroughly (if your kale is coming from your garden, tiny aphids like to hide on the back of the kale). Using your hands, separate the kale leaves from the stems and then tear into bite-size pieces. Dry with a towel or a salad spinner. 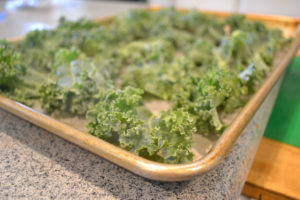 Lay kale pieces out on a cookie sheet. Throw your kale into the oven and cook for 25 minutes. 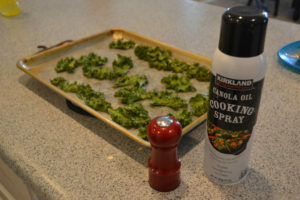 Pull the kale out of the oven and spray with cooking spray and season with salt or whatever seasoning you would like. You can try soy sauce, sesame seed oil, dry ranch, parmesan cheese or dried red chili peppers. Cooked kale ready to be seasoned. #3 Crisp the kale chips and enjoy! Turn off the oven and place the kale back in the oven for 20 minutes. 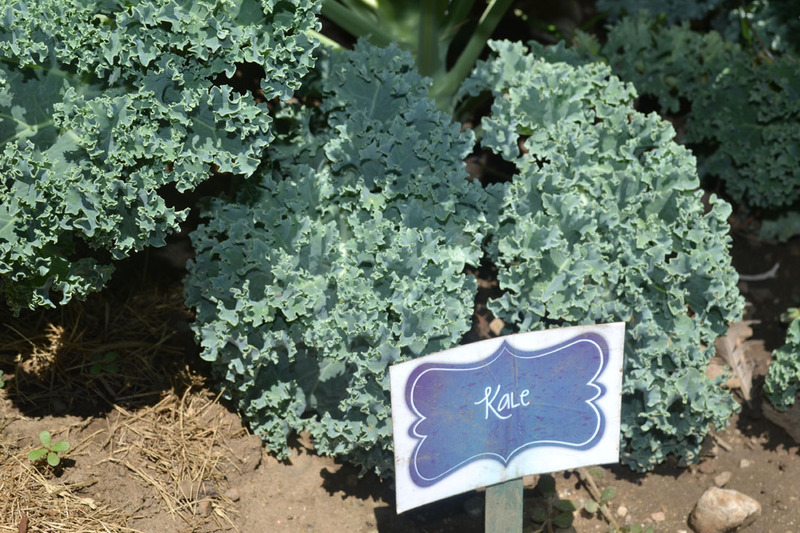 The kale will continue to crisp and form its chip-like texture. After 20 minutes, pull it out of the oven and enjoy! I have found that kale chips are the best when eaten fresh. They don’t taste quite as good even a few hours later. What ways have you found work the best when making kale chips? Leave your comments below. One Thing Every Mom Needs to do Today!